Take the Nyzul Isle Staging Point and then the teleporter at (H-8). Take the dim teleporter to the east and proceed forward to the zone to Caedarva Mire. In Greek mythology, the Khimaira (Chimera) is a monster which had the head of a lion, the body of a goat, and the tail of a snake. Sometimes it is described as having both a lion’s head and a goat’s head. It was described as being female (despite being featured with a lion’s mane) and could breathe fire. The Chimera was slain by the hero Bellerophon riding the winged horse Pegasus. The Chimera resided in Lycia (located in Asia Minor [Turkey]). 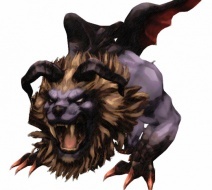 The Chimera was the offspring of Typhon and Echidna along with Cerberus, Hydra, Ladon, Ethon, and Orthrus. The more recent usage of the word refers to any creature that is a combination of other creatures, leading to its use in genetics research to describe a single organism with genetically distinct cells from from two different fertilized eggs, the first step in creating genetically engineered organisms. It is also a word in the English language which refers to a figment of the imagination or any unrealistic idea/concept or any plan that is totally impractical.